BWRAP and WAR are joining actions wherever we are. Low wages, zero hour contracts and lack of other employment rights make women in particular vulnerable to sexual violence and workplace exploitation. Women have kids to feed, and when wages are low, and they may face sanctions and even the sack if they report abuse, it is really hard to complain or speak out about it. But workers have had enough and are organising together. At McDonalds in the US on 18 September workers held co-ordinated strike/walkouts in many US cities, to publicly expose the systemic abuse. This includes groping, sexual demands and other abuse from colleagues and employers. Those who report it to managers are ignored or punished. When women workers came out in the US, they arrived wearing tape over their mouths with #MeToo written on it. Some of their placards read “I am not on the menu”. Let’s show our support for the low-waged women who are striking – because their actions are in everyone’s interest. 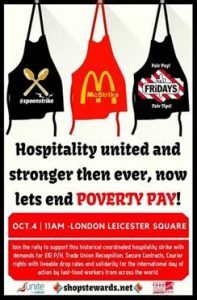 Find a nearby action, or organise your own: https://waronwant.org/mcdonalds-respect-union-mcstrike-action. Please let us and others know what you are doing.